An ECN forex broker allows people to open forex trading accounts and trade forex through the internet using a trading platform such as Meta Trader. You can begin by practising trading on a demo account and move over to a live trading account when you are ready. There are plenty of forex brokers to choose from before you begin forex trading, so be sure to do your research and ensure that your chosen broker meets certain criteria. They should provide low spreads, low commissions, fast execution and no limitations on stops. ECN forex trading accounts form the ultimate trading environment for trading currencies, this is why it is highly recommended to choose an ECN forex broker. A broker with an ECN/STP environment is your best choice as they will give you fast execution, little slippage, tight stops and tight spreads. I have thoroughly researched and tested many ECN forex brokers and recommend IC Markets out of those that I have thoroughly analysed and determined IC Markets provide excellent customer service whilst being the perfect true ECN forex broker. The type of broker that you choose to use can have a significant impact on your forex trading performance. If you opt to use a retail market maker forex broker that does not execute your trades on time and at the initial price that you wanted, what may have been an opportunity for a good trade can rapidly descend into an unexpected loss – through no fault of your own or due to your forex trading system but due to the impact of choosing an unreliable retail market maker forex broker. Therefore, it is upmost importance that you carefully analyse the advantages and disadvantages of each forex broker before making a decision on which one you would like to open a forex trading account with and trade through. I highly recommend that you only consider using a true ECN forex broker for your forex trading for the best possible trading conditions and no conflict of interests, IC Markets being my best forex broker recommendation. An electronic communication network (ECN) is an automated system that will match forex traders buy and sell orders. An ECN will connect to major forex brokerages worldwide and individual forex traders enabling them to trade directly between themselves without the need of going through a middleman (such as a market maker). The ECN makes money by charging a small fee for each conducted transaction, known as a commission. ECNs give the possibility for forex traders in multiple different locations around the globe to trade with each other in a fast and efficient manner. The Securities and Exchange Commission requires ECNs to register as broker-dealers making them extremely reliable and completely transparent. ECNs pass on all of the prices from multiple forex market participants, such as banks and market makers, along with other forex traders connected to the ECN. They display the best bid/ask quotes on their forex trading platforms based on these prices. ECN forex brokers also serve as counterparties to forex transactions, although they operate on a settlement, rather than a pricing basis. Unlike fixed spreads that are offered by some market makers, the spreads of currency pairs do vary on ECNs, dependant on that particular pair’s trading activity. Market makers can also increase the spreads making it more difficult for the forex trader to be profitable and so that they make more money for themselves by increasing the trade costs. During trading periods of high activity, you will sometimes get zero ECN spread, particularly on the very liquid currency pairs like the majors (EUR/USD, USD/JPY, GBP/USD and USD/CHF) and also on other currency crosses. ECNs make money by charging their customers a fixed commission for each trade transaction. Genuine ECNs are not involved in making or deciding prices, which therefore significantly reduces the risks of price manipulation for retail forex traders. You can claim cash back forex rebates from the trade commission and spread costs. As with market maker forex brokers, there are also two main types of ECN forex brokers, these being retail and institutional. Institutional ECN forex brokers give the best bid/ask from multiple institutional market makers such as banks, to other banks and institutions including hedge funds or large corporations. Retail ECN forex brokers will usually offer quotes from a few banks and other traders on the ECN to the retail forex trader. This gives you as the everyday normal person an excellent opportunity to gain access to trade on an ECN forex broker. What is a market maker (dealing desk) non-ECN forex broker? 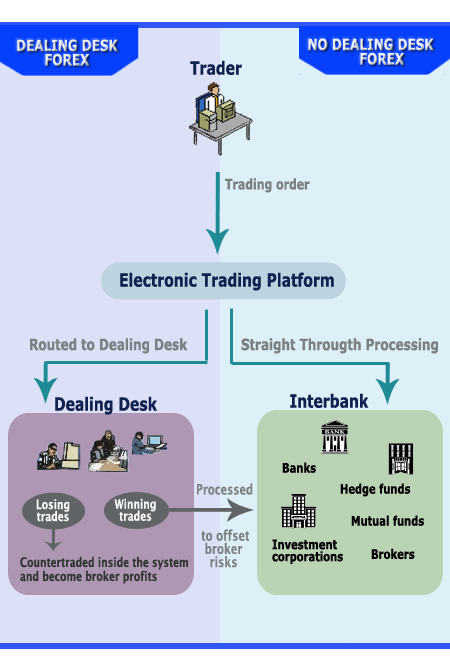 When using a non-ECN forex broker often referred to as a market maker, there is a usually a dealing desk used by the non-ECN forex broker that trades must pass through before completed execution which can lead to slippage (actual entry price different from initial quoted price) and higher spreads . Market makers add to liquidity by being ready to buy and sell designated currencies at any time during the trading day but make large profits from increased spreads and by taking the opposite side of your trade. Market makers “make” or set both the bid and the ask prices on their systems and display them to the public on their on screen quotes. They are ready and prepared to conduct transactions at these prices with their retail forex traders. By doing this, market makers provide some liquidity to the forex market. As they are a counterparty to each forex trading transaction in terms of pricing, market makers must take the opposite side of your trade as the retail forex trader. What this means is that whenever you place a sell trade, they must buy that currency pair from you, and vice versa. This can cause a conflict of interest as affectively when you make a successful trade the market maker makes a loss. They will often increase spreads and create additional slippage to make forex trading conditions more difficult for the retail forex trader. The forex trading rates that market makers set are therefore based solely on their own personal best interests. They will make profits for themselves via their market-making activities through the spread that is charged to their customers and in some cases by artificially creating additional slippage so the retail trader gets a worse price than anticipated. The forex spread is the difference between the bid and the ask price, and is more often than not fixed by each market maker. Usually, spreads are kept fairly reasonable as a result of the stiff competition between numerous market makers but this still does not compare to the real spreads provided by ECN forex brokers. As a counterparty to forex retail traders, many of them will then try to hedge, or cover, your order by passing it on to someone else. There can be times in which market makers will decide to hold your order and trade against you. There are primarily two main types of market makers which are retail and institutional. Institutional market makers can be banks or other large corporations that usually offer a bid/ask quote to other banks, institutions, ECNs or even retail market makers. Retail market makers are usually companies dedicated to offering retail forex trading services to individual traders which is why it is important to know the difference between a retail market maker forex broker and a true ECN forex broker – it can have a substantial impact on your forex trading costs and profitability. Retail Market maker forex brokers can have a clear conflict of interest in your order execution (slippage) and spreads, because they may be trading against you. They can often display worse bid/ask prices than those of which you could get from a true ECN forex broker. They are able to manipulate currency prices to hit their customers stop loss or to prevent customers open trades reaching their profit objectives. Market makers also have the ability to move their forex quotes 10 to 15 pips away from other market rates. A large amount of slippage can happen when news is released. Market makers forex bid/ask quote display and trade placing systems may also hang up (freeze) when there are times of high market volatility. Most market makers do not like forex scalping systems will tend to put forex scalpers on manual execution, so that their trade orders do not get filled at the prices the scalper wanted. Hopefully you have read through the detailed explanations describing true ECN forex brokers with market makers and now have a clear understanding of both. I am sure you will agree that trading on a true ECN forex broker is the best forex trading solution! IC Markets is my top recommended ECN forex broker based on personal experience. I have a live account with them and have been very happy with them for years now. 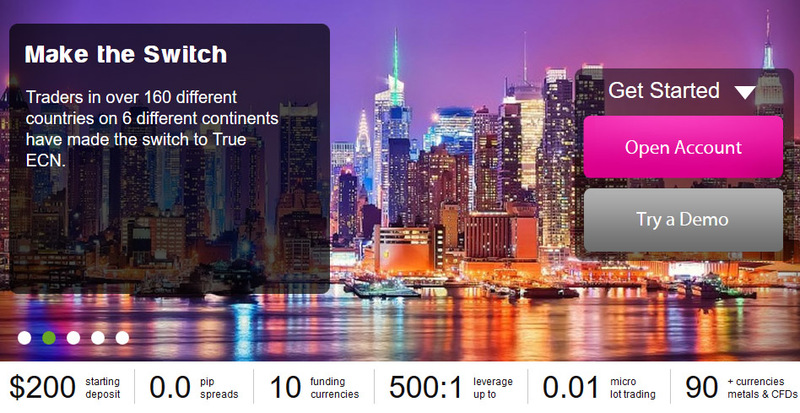 How do I apply for a true ECN forex broker account? When you are ready to open an ECN forex broker account visit IC Markets and apply for your very own personal ECN forex trading account – they have various account options starting from just $100.Once you have had your application processed (usually within a day at the most) you are ready to start trading with good trading conditions. Please always conduct your own due diligence on all forex brokers.